Sometimes the internet amazes me with its accidental usefulness. 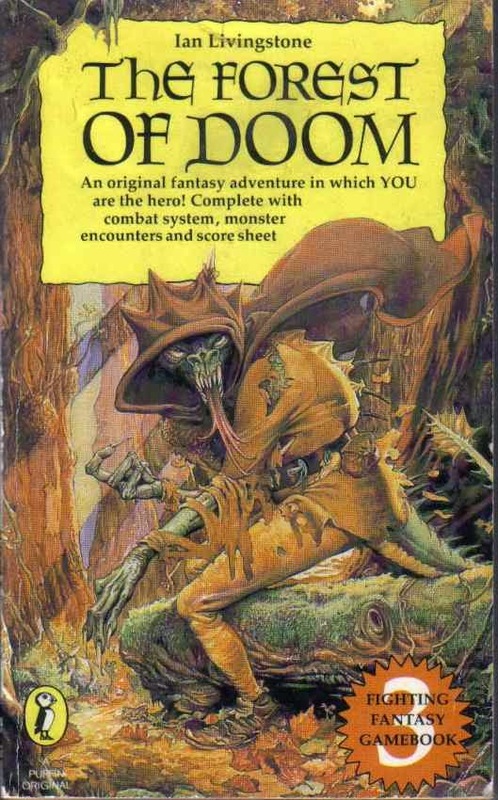 A short while ago I was searching for an action packed fantasy novel and so I searched for “best fighting fantasy novel” and an image for The Forest of Doom popped up. Immediately I recognized the cover. This is the book I borrowed from my elementary school library. Except for the words, it was in French book, this was the exact cover of a book that has been in my mind for years. I may even have mentioned it on the blog one or twice. I remember this book because of its striking cover, it’s simply gorgeous, but also because it’s the only choose-you-own-adventure fantasy novel I’ve ever encountered. More than that, I remember there was a character sheet and dice rolling involved. At the time, I didn’t use the adventure sheet, didn’t keep score when I fought monsters, and I didn’t roll any dice. I didn’t want to write in the book because I’ve always taken good care of books. Worse, I didn’t have a way of scanning the pages and making copies so I read without playing but it amazed me nonetheless. Simply put, it was a wonderful reading experience. I never remembered what the title was so I haven’t been able to search for it with any success. Thus it stayed lost to me until a couple weeks ago. Thanks, Internet. Any fan of fantasy that grew up during the 80s or early 90s is probably familiar with this type of book, if not with this book specifically. Fighting Fantasy books were a huge hit at the time and they’ve had a resurgence of sort in the last decade. Recently they’ve been taking on the form of mobile and table apps with apparent success. For those who aren’t familiar with Fighting Fantasy, it’s a series of novels that combined choose-your-own-adventure books and table top role playing games in the vein of Dungeons & Dragons. The result is a role playing adventure you can play on your own and essentially anywhere. To be clear, the kind of enjoyment you get out of book like The Forest of Doom is more akin to playing a game of adventuring and monster slaying that the kind of entertainment you would get out of a straight-up novel. If you need more information about these books or if you’re simply interested in the origin of Fighting Fantasy, I urge you to read Damien McFerran’s comprehensive history of the series at Euro Gamer. It’s the best article I’ve found on the subject. The Forest of Doom is the third book in the Fighting Fantasy series. It is written by Ian Linginstone with interior illustrations by Malcolm Barter and a cover y Iain McCaig. The story is quite simple, you are on the edges of a forest when a dying dwarf stumbles onto your campsite. Before dying he entrusts you with a mission to find the legendary Hammer of Stonebridge and he pays you 30 gold pieces for it. You must journey into Darkwood Forest and find both pieces of the hammer as the head and the handle are separated. In the forest you must face all manner of foul beasts and evil creatures. It’s a simple but effective setup for the adventure. “Two dice, a pencil and an eraser are all you need to make your journey. YOU decide which parths to take, which dangers to risk and which monster to fight.” Game on! I had three adventures with The Forest of Doom. My first one was a blast but ultimately a pretty spectacular failure as far as completing my mission. I made it through the forest but I almost died several times and the monsters I managed to kill almost had the best of me. I didn’t find any of the hammer pieces and when I arrived at Stonebridge I met a disappointed dwarf who gave me the option of walking around the forest to start my adventure anew. While do just that I was attacked and killed by Wild Hill Men. I didn’t do anything that I had set out to do. My game was essentially an exercise in putting off the inevitable death that awaited me in the eponymous Forest of Doom. My second adventure actually went better. I was a little more informed as to what to expect in the forest and so I was able to prepare for it. I went in a completely different direction than my first trip partly because I wanted to explore the rest of the forest and also because I didn’t find anything of value in my first trip. Shortly after I stared the second adventure I found my first piece of the Legendary Hammer. It took a long time and a lot of exploring to find the second piece but I had some good enough stats that I was able to make it through the forest without too much trouble. I had to use my provisions to heal regularly but avoiding death is basically all you need to do to keep going. After finding the second piece of the hammer I fought the Wyvern a second time, it was easier because I had a flute, and walked triumphantly into Stonebridge where the dwarves rewarded me with riches. I’m actually a little disappointing the second go around was more or less easy. It could also be that my first trip into Darkwood was pitiful and my second trip only looks good in comparison. The third round was actually played by Lisa, my young sister-in-law. She’s twelve and I thought she might be the right age group to really appreciate this kind of book. She also happens to be a fan of fantasy and science fiction movies, many of which we watched together. She was incredibly lucky with her dice roles before the start of the game so two of her three stats were maxed out and the third one was only missing one point to be at its maximum. Naturally, it was advantageous to her during gameplay. She started out being very careful and pretty skittish. She ran away from potentially dangerous sounds or dark tunnels in the ground. After I commented on this she started to be a little more daring. After about two fights with monsters her confidence shot through the roof. She became arrogant and overly confident in her skills as a fighter. At that point she started to actively seek out opponents and she more or less forgot about her mission. In one memorable series of battles, she went down a well and crawled through three separate tunnels not, you must understand, in search of the Hammer of Stonebridge, but in order to slay all of the Gremlins she could find. She found five and none of them could even remotely stand up to her since her Skill and Stamina were so high (she kept her Stamina high by using her meal provisions and regaining her Stamina points when it got too low, which wasn’t often). The game lasted for nearly three hours and she only lost after being killed after restarting from the beginning when she arrived at Stonebridge empty handed. Her stats were helpful through the entire game but in the end, her complete disregard for her safety resulting from the confidence she placed in her Skill and Stamina resulted in her downfall. It was a joy to play with her. I read the passages in the book, putting emphasis here and there (“The forest of dooooom”, “Out from the shadows emerged . . . a werewolf!”). I also rolled the dice for the various monsters. It certainly made it more entertaining for her because she didn’t need to worry about the rules but they’re simple enough that she picked up very quickly and I didn’t even need to say anything to her. She knew what to do and when and understood why. I also let her do most of the math in her head which is a good exercise for since we often defer to calculators when they’re not really needed. I’m pleased to say she even wrote out additions and subtractions on her adventure sheet when she wanted to make sure she was calculating correctly. Another reason I liked to read for her was that it prevented her from cheating! It’s far too easy to cheat while playing a Fighting Fantasy gamebook but by relinquishing that control to me she was unable to try cheating though she jokingly asked if she could back track a few time knowing that I wouldn’t let her. I’ll have to bring another Fighting Fantasy book the next I visit because she had so much fun. Even her dad who was watching TV shouted a few suggestions from the other room. It’s so easy to get wrapped up in the story’s events that you can barely resist jumping in, even if it’s only temporary. I didn’t have as much fun reading The Forest of Doom alone but that’s ok because I’ve found a partner who’s willing to play along with me. It’s not exactly a two-player game but we made it work and we both had fun. That’s really what these books are about and it’s surprising how invested you get when you’re at the heart of the story and are given control to do as you please. After playing my first Fighting Fantasy book, as opposed to simply reading it like I did when I was young, it’s clear to me why they were so popular before and continue to endure today. The cover of The Forest of Doom by Iain McCaig is pretty spectacular. Even though I haven’t seen it in several years, I still recognized it immediately for what it was. It imprinted itself into my brain. The forest he draws looks pretty dense and everything looks a little bit sickly. It gives off the impression of danger. The monster is superb. It’s original yet a little familiar; probably do to its reptilian features and humanoid shape. The face has all the elements of a human face (eyes, nose and mouth) but the proportions and shape of those features have little bearing on anything human. Likewise the hands are one finger short and too long to look too human. It’s clearly a monster but it also looks as though it’s a creature that thinks. It looks deadly not only because of its claws, spikes and sharp teeth but because it looks intelligent enough to know how to use them in the most effective ways. What makes this cover so effective is that you feel the danger and the creature’s hand is curled in such a ways as to taunt you to enter at your own peril. Come into Darkwood Forest and see what else you’ll find there. It’s great stuff.